Nancy Magnuson, owner of Nancy's Candy Etc. Owner/ proprietor Nancy Magnuson has served candy to Cape Cod for over 30 years. 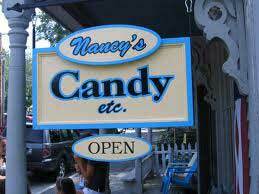 Nancy’s Candy Etc. opened in April 2011, in the “old post office” building in historic Dennis Village where Nancy continues to treat her customers to a selection of sweets, gifts and Etc. that appeals to visitors of all shapes, sizes and ages.